intimate wedding in olympic national park. need I say more? We absolutely adore intimate weddings. They are always so personal + unique - two of my favorite parts about any wedding. Karla + Philip came to the peninsula from Florida for this little dreamy wedding getaway. 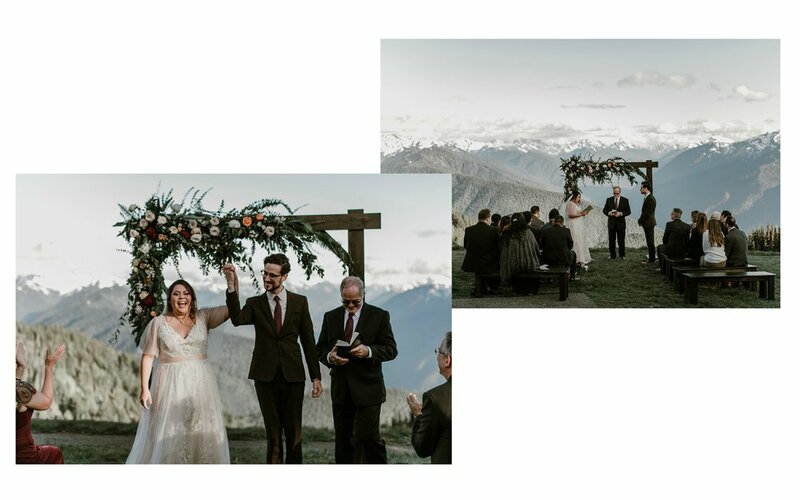 The ceremony was up at Hurricane Ridge with a reception back in Port Angeles. The ceremony was idyllic + intimate. It was a beautiful sunny day + the Olympic Mountain Range was just glowing in the background. The reception was a lovely dinner part at one long table under twinkle lights + the stars! The table was styled by Manda (owner of Mae + Co) + we did lots of lush centerpieces running down the length of it. The cakes were another fav detail, not one but THREE all different with lush florals atop! annnnnnnddddd, as if the rest wasn’t enough, they did more day after photos! Karla was one of the sweetest brides we’ve worked with + we will be swooning over this day for a long time!